And now for something completely different. 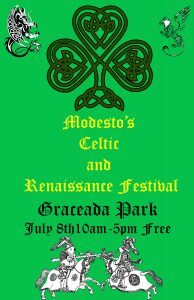 Travel back in time and experience Modesto’s Celtic and Renaissance Festival happening in Graceada Park July 8th. 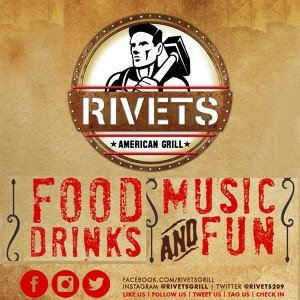 It will be a day filled with family fun the likes Modesto is rarely treated to. Steam House Entertainment the folks who brought you Steam House Con and Modesto’s Classic Comic Con(happening again October 27-29th at the Modesto Center Plaza) is hosting Modesto’s First Annual Celtic and Renaissance Festival. The Event is FREE to attend and starts at 10 am and continues until 5 pm. Enjoy vendors, artisans and crafters such as Ministry of Food which will be serving traditional British cuisine and the Cheeky Archer who will be teaching archery at the event. Pick up a book by author Angelique S. Anderson or something from one of the many other vendors. Dress up and join in the Costume Contest hosted by the NorCal Cosies. Enjoy performances by Danse Macabre, Arabian Jewels, Ashley Dahlin and birds of prey demonstrations by Full Circle Falconry. Meet local cosplayer Ashley Fee who will be dressed as Arwen Queen of Gondor and also members of the Miss Harvest Festival. These are but a sampling of the fun and interesting things that will be happening. Come out bring the friends and family and let’s make this an ongoing Modesto Tradition.